This topic describes the application UI description file, required when submitting an application to the Samsung Apps TV Seller Office. When submitting your application, you must include an application UI description created using the provided template file. It documents your application UI and helps the QA certification team test the application efficiently. You must update and resubmit the application UI description whenever you submit an application update. Use the provided template file and follow the instructions in it. Do not add or remove content, or modify the structure. By ensuring that your application UI description conforms to the template, you ease and accelerate the testing required to approve your application for publication. On the title slide, enter the application and content provider name. The revision history documents the changes made to the application UI description. Include the file version, date, list of changes, and author. You must also define the application version related to the file version. 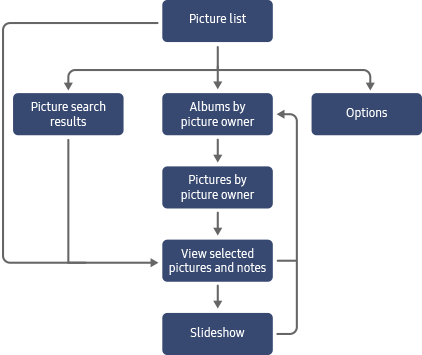 Illustrates the overall structure and navigation flow between application pages. Provides detailed instructions for using the main application features. Labels and describes the screen components for all application screens, using screenshots. Describes the remote control key functions. Specifies whether the application language can be changed and how to do it. If your application supports English, use English screenshots in the application UI description. If English is not supported, provide translations for all screen texts. Use a flow graph, tree structure, or depth navigation diagram to illustrate the navigation between all screens in the application. The UI structure diagram shows the overall structure of the application. It does not show or describe the content on individual screens. All application screens and navigation paths must be included in the UI structure diagram. For clarity, show the application screens as named boxes, instead of using screenshots or photographs of the actual screens. 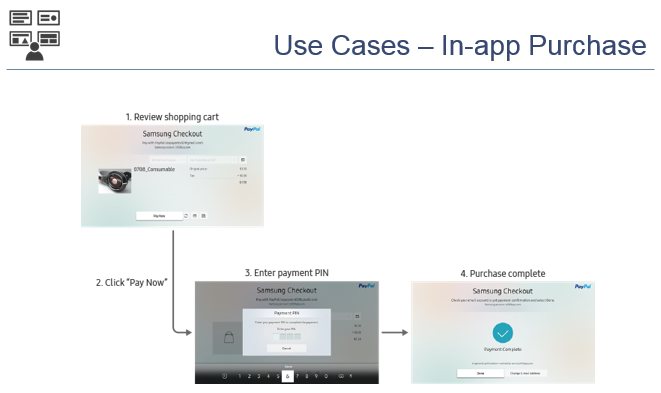 Describe the application functionality in detail, by dividing it into clear use cases. 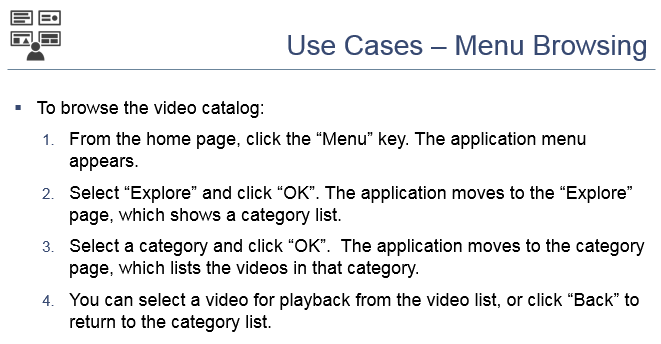 A use case is a specific and defined task the user can or must do, such as searching for content or playing a video. The use cases must cover the main functions or scenarios of the application. In addition to application-specific features, you must also describe any general user login, menu browsing, and in-app purchase features. Do not provide a list of application screens, describing what the user can do on each screen. Such information must be provided using screenshots in the "Menus and Functions" part. Label each use case with a title. 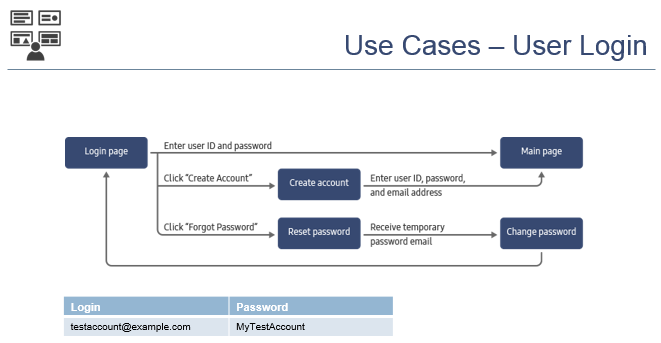 For each use case, describe the steps the user must perform to do the task. You can use text, figures, and screenshots in the descriptions. Since the launch process is the same for all applications, do not describe how to launch the application. Refer to application screens with the names you have defined for them in the UI structure diagram. Missing information is a major cause for application rejection. If your application includes any of the following features, you must provide additional information within the applicable use cases. For more information, see "Samsung Apps TV Seller Office > Guide > Self Checklist". This part of the application UI description is a frequent cause for application rejection. Make sure your use case descriptions are complete, and include all the information needed for the QA certification team to fully verify each use case. Use labeled screenshots to describe the UI elements and their functions on each application screen. Provide a screenshot of each screen defined in the UI structure diagram. Label all clickable and non-clickable UI elements with names or numbers. If there are many elements, use number labels. Accompany each screenshot with a table describing the UI elements. For clickable elements, describe what happens when the element is clicked. Provide English translations for titles, headings, and button labels, if needed. Make sure your menu and function descriptions are complete. Providing only screenshots without function descriptions is not acceptable. The "Return" and "Exit" keys are designed to return to the previous screen or close the application. These functions are mandatory and common to all applications. Do not modify them. If the application supports multiple languages, describe how the user can switch the application language, such as by changing the TV language or country settings, or selecting the language within the application settings. If the application does not support multiple languages, state that the application has no language options.